As you know, every square feet of our planet receives huge amounts of energy which is sent by the sun. This energy, free, infinite, non-polluting is at our hands, but unfortunately for some sad reason we continue to use fossil fuels with all their harmful consequences to our environment. Is it possible to easily use some of that energy? Yes, but of course there is no question of power your toaster, your electric heating or your car (at least for now), but you can easily light a part of your home. The idea for me was to use solar energy to charge a battery, this battery to be used to illuminate the terrace during the summer evenings. Once the system is installed, I realized that energy was well above this target, so I could expand a bit the system to multiple rooms of the house. The purpose of this page is to fancy you to start, it's now technically achievable. 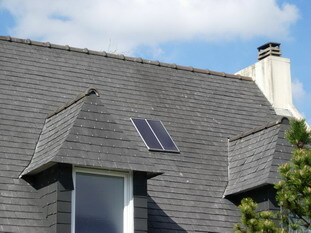 A solar panels, located on the roof, receives sun light and converts it into electricity. This electricity is a voltage of about 20 volts, which varies depending on lighting conditions: there is more light and more energy is produced. Of course, during the night production is stopped. Power of pannels is sent to a regulator which transforms it into a stable voltage of 12 volts. Those 12 volts are used to charge a battery that accumulates energy as its production. Regulator also acts as a distributor, it delivers 12 volts for consumption but it is he who determines where the energy comes either directly from the pannels (if there is light) or from the battery if collector does not (eg at night). Produced energy can, through the system, power "something". That something in my case would be light bulbs. I thought initially use small halogen bulbs, but they consume a lot of energy and the risk of draining the battery quickly was big enough. Fortunately, in the meantime I found the LED bulbs, these are small classic spots, but instead of a conventional incandescent bulb they are composed of a series, more or less, of leds which light with a cold light (ie without heat). These LEDs are ideal for use in this context: they need 12 volts and consumes very little (2 or 3 watts, compared to 75 watts of a conventional bulb). 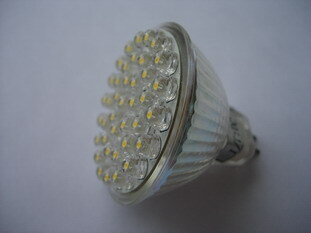 Unfortunately, they do not get the same brightness of conventional bulb, so you will need to put several bulbs led light bulb against a single standard, and their light is less pleasing than a light bulb incandescent. There are two panels in parallel, all give a power of 20 watts for an area of slightly less than 3 feets square. 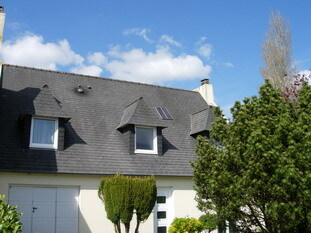 You can find solar colectors easily now, I bought them on eBay three years ago about a hundred euros. They are bolted side by side on an aluminum piece to prevent corrosion. We must lay the collectors as possible facing south and tilted to an angle equal to the latitude of the place (about 45 ° for Brittany). Anyway all this is theoretical, the most important thing is that it is well south to get the maximumof sunlight. Wires emerging panels pass through the tiles to reach the regulator. 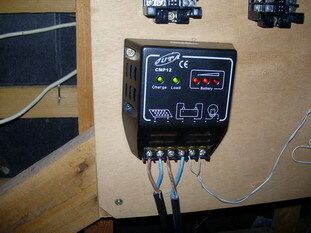 It also presents a few lights to verify the correct functioning of battery, power, and panels. That's very simple, just use a simple car battery. 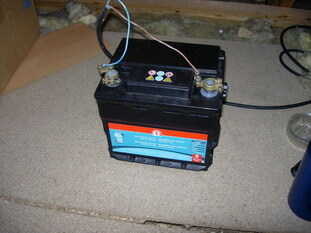 It is better to use a new battery rather than an old or second hand one, because it is an important element of the whole. This is the famous 12 volts spots. Their quality and light output is increasing, the first that I had bought was 18 LEDs and illuminated only a bit, there are now 36 and sometimes more leds that a pair could easily replace traditional bulb. Again you can find them easily on eBay, but be careful with voltage use because there are also operating at 220 volts. 12 volts spots are MR16 type and 220 volts are GU10. 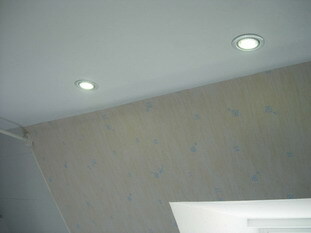 For inside rooms (WC and bathroom) I have completely removed classical light bulbs because spots are enough. I have not calculated money savings, the approach was more "sustainable development", but just by knowing I removed 7 light bulbs of 60 or 75 watts, is already a success. So, my goal was to convince you that you can now put a bit of sun in your home, without necessarily living in a very sunny corner. Feel free to get started, it will be good for your wallet and the planet.